With the latest in cosmetic techniques, you can say ‘good-bye’ to spaces, loose partials and embarrassing situations. Enjoy the comfort and confidence of a fixed bridge. At the practice of Dr. Camilla Savardi and Dr. Tom DeLopez, extensive casework and training produce the most natural results in bridges today. 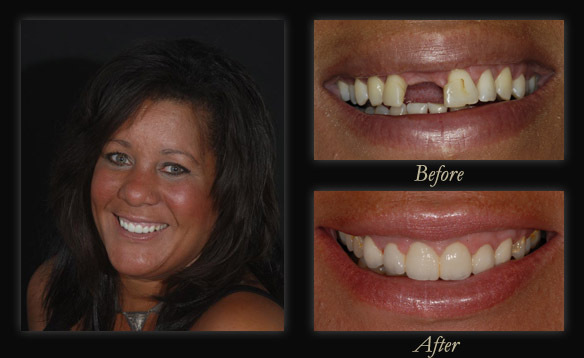 It is like growing a new tooth – without the surgery and time required for implants. In just a few weeks, you can have a permanent replacement for that missing tooth and improve your appearance and chewing ability. Bridges are not only a good option for enhancing your self esteem and confidence. They can actually prevent other serious symptoms caused by missing teeth and gaps, by supporting the existing teeth and preventing them from drifting out of alignment. Providing this support and structure can even have a profound effect in keeping the bones of the mouth and jaw healthy – meaning a more youthful, healthy appearance to your face and mouth. In 2008 at the Florida Academy of Cosmetic Dentistry’s annual meeting, 3 gold medals were awarded for fixed bridges. Dr. DeLopez won all three. Bridges are oftentimes provided to patients for function – but rarely do they combine esthetics and naturalness to the award-winning extent that Dr. DeLopez provides to his patients. Many of out anterior bridges are made from new, vibrant ceramic and zirconium materials. This eliminates the unsightly ‘grey lines’ or metals that that can be visible with traditional bridges. These materials can increase the health of your smile with their strengthening support, and are a great investment for longevity. Orthodontics, bleaching, white fillings and a 3 tooth Rockwell all ceramic bridge with a single ceramic crown completed this beautiful smile. Bridges by Tom E. DeLopez, Tallahassee Dentist.